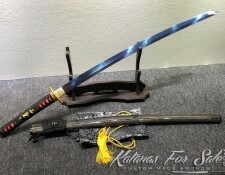 Katanas are particular Swords. They are interesting traits of the Japanese History. 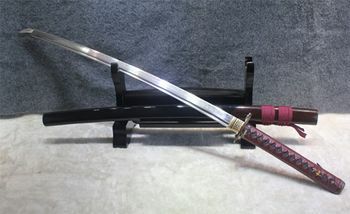 They are used to be weapons of that warrior’s class called Samurai. 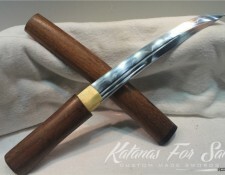 Traditionally handmade weapons, they are made of several parts which are mounted together to form the Katana according a very particular design that has to be respected. 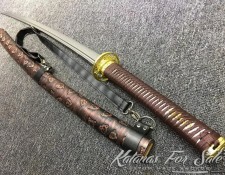 Katanas are therefore sophisticated weapons which are made to be pieces of art. 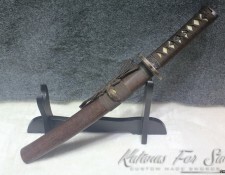 These weapons are often customized and constructed as the demander (the warrior) wishes. 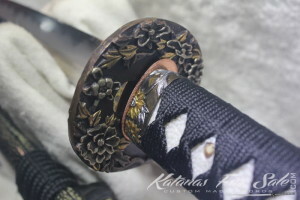 Because of this characteristic and in addition to the hand making process, every Katana is a “Unique” piece. 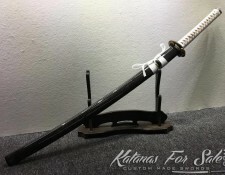 Several materials are involved in the making process of the katana; from materials prepared within the workshop, such as the steel type to forge into blades, to the natural materials, such as wood, ray’s and shark’s skins for the Tsuka. 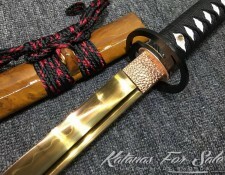 Actually ray and shark skins are used to coat the wood of the Tsuka before mounting the Mekugi, Menuki and before wrapping the Tsuka Ito. 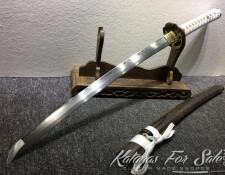 Ray Skin and Shark Skin are two type of coating materials for the Tsuka and they are naturally harvested and are treated according specific ways to turn them into coating material that lasts for long time. 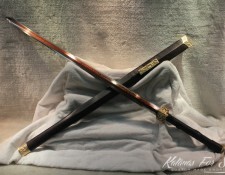 As Samegawa is fused to coat Tsukas, it is important to know the particularities of this material to make it preferred as coat for the woody handle. Ray and Shark Skins are characterized by a granular and rough surface. They are useful when applied on surfaces and tools or parts of tools that are destined to be grabbed by hands and which are intended to be smooth and where hands can cling. 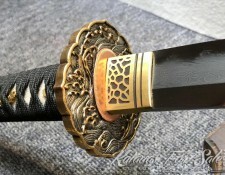 Samegawa is primarily destined to keep the sweating hands dry and don’t allow them to slip over the Tsuka while practicing. This role is enhanced by the presence of the Menuki which have the same role. Samegawa is tough skin, with excellent resistance to the effects of fluids and humidity released by the hand palms. 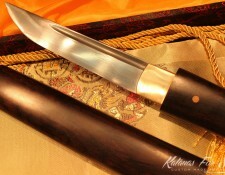 The toughness of the Samegawa is impressive if compared to its thickness; the skin is hardly stretched and it is not extensible. Flexibility is also impressive when compared to toughness; the skin keep pliability. 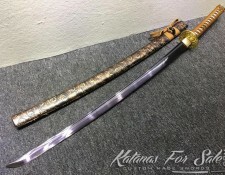 In sum, the Samegawa combines several properties that are rarely found in others creatures skins, for example mammal skins, which thicker and more susceptible to absorb humidity and interact with sweat components, or bird skins which alter rapidly, or reptile skins which are very smooth to be used in Katana handles. 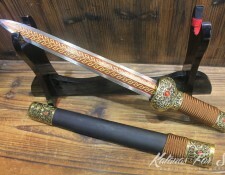 Ray skin and Sharkskin are known by “Shagreen” prepared according particular process to make it suitable for use as coat for scabbard and handle. This material has not been exposed to extensive herbal tanning and therefore it is qualified as rawhide, that means that ray and shark skins can receive the minimum treatment and still useable and keep their cherished properties. These Skins are initially and naturally covered by several placoid scales, which are round and arranged one next to the other. These are calcified papillae which vary in size with the animal age. These scales are treated to bring them at the same level of elevation order to obtain the uniform roughness. glowing property of the skin with no threat that the color will dissolve with repeated contact with the hands. 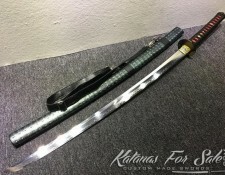 It is important to notice that there is a particular region on the back of the Ray where the skin is the thickest and more susceptible to provide a better coating material for the Handle of the Katana for sale. Samegawa is then preferably made of this specific region. 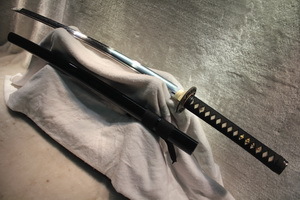 Actually, there are several types of wrapping Samegawa over the Tsuka; each method consumes a certain proportion of material and has its aesthetical sides. 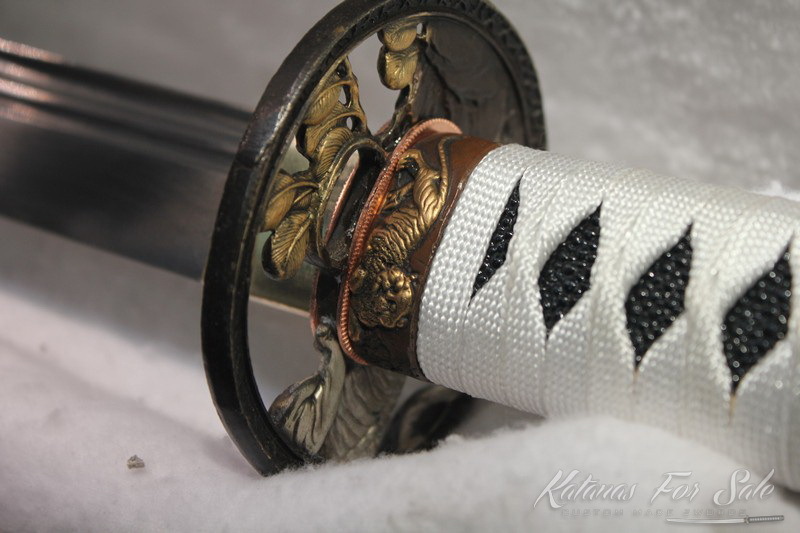 There are some wrapping types which are made of one single piece of Samegawa; the difference is in the rolling side and amplitude of the enrollment. 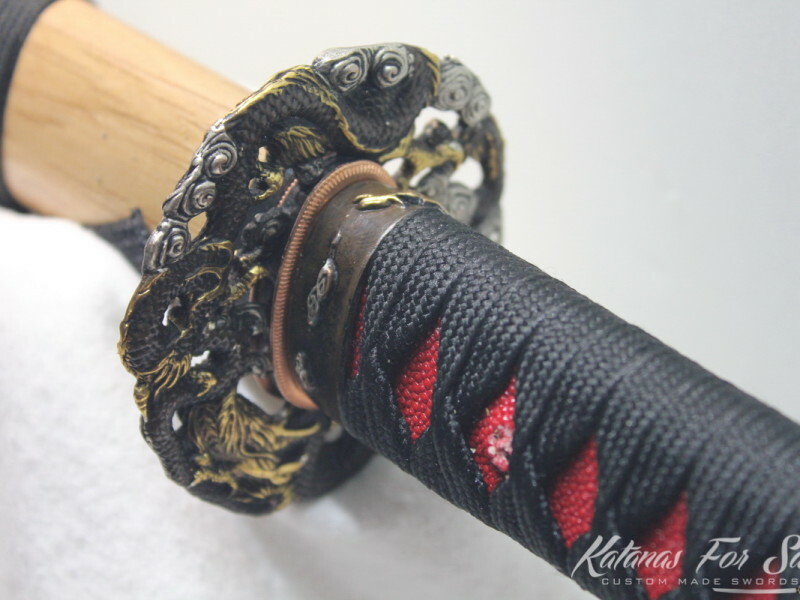 The Samegawa is then applied with enough glue to stick it on the Tsuka. 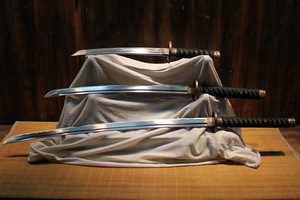 Tanzaku: This wrapping type is made of two equal pieces of Ray skin symmetrically set, one on the left side and the other on the right side of the Tsuka. They are not linked to each other. Maru-gise: Made of one single piece of Ray skin. The piece of skin is enrolled till the borders match each other. 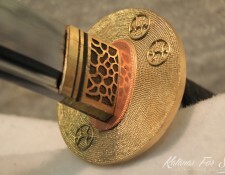 That procedure let appear a line that go across the Mekugi hole to signal the reverse side of the Handle. 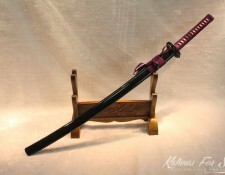 For some aesthetical reason and as requested by the Katana demander, the line can be placed under or over the Mekugi line. 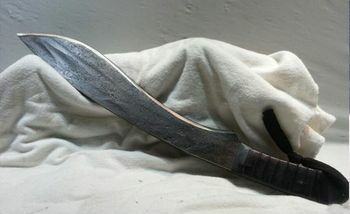 But for the traditional reason, it is always let clear on the reverse side of the handle. Maedare-gise: in this case, the piece is larger than the perimeter of the handle and one border comes over the other. 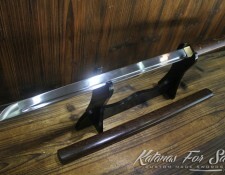 This type supports the handle and reinforces the compound; it is the tougher type of wrapping. 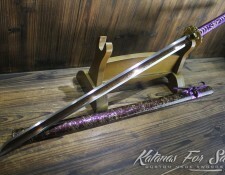 Actually this is a particular type of wrapping and it is used to be reserved for high class Katana holders as Feudal Lords. 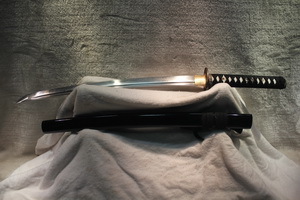 Samegawa has the role of supporting the Tsuka and reinforcing its tightness around the Tang; it has also the duty to ornament the Tsuka and support the hand when they grab the sword. The social significance is acquired by the type of wrapping applied. 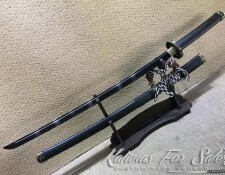 Thus, Customizing the Samegawa is nothing but a simple task that the demander can ask for. 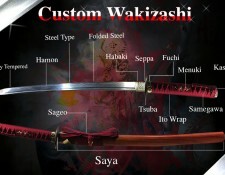 He has only to request the type of wrapping he suits and the Tsuka will be. 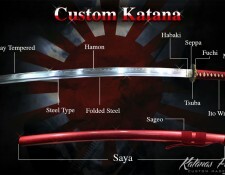 Moreover, the overall design of the Katana can implicate the wrapping type and the color to print on the material. 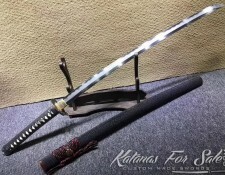 It is recommended to know exactly the purposes of the Katana to know what factors to consider when making the selection.